I am asking $30 for all 6 egg hinged boxes. I am asking $10 for all 8 carrots. I am asking $5 for all 12 baskets. I am asking $10 for all 4 bags. These 2 ceramic hinged boxes make unique Easter-themed gifts. They have a blue and white checkered pattern with red detailing on the outside and they are white on the inside. They measure (when closed) 1.75"L x 1.25"W x 1"H. Inside, the bottom is divided like an egg carton with 6 compartments which supports 6 miniature removeable eggs, hand-painted to look like Easter eggs. I am asking $20 for both egg carton hinged boxes. I have 1 unopened package of fifty egg shaped part favour tags. There are 4 colours/patterns, 10 of each with a colourful twist-tie attached measuring approximately 1.5" x 3". They can be used to tie cellophane hostess bags or attach to anything as decoration. I am asking $5 for this package of 50 tags. All 6 lots add up to $80. Again, you are welcome to buy individual lots or I will sell everything for $35. I am located in Vancouver, BC but shipping is no problem. 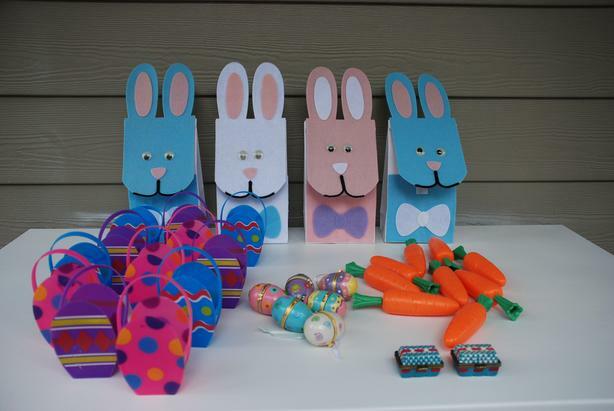 I will be happy to mail these Easter party favours to you using CanadaPost and Interac bank transfer. So, if you are interested in purchasing, e-mail me and we'll figure out the logistics and/or I can answer any questions you may have. Thanks!